After Bryan Kerchal won the Wrangler/BASS National Federation Championship in Pine Bluff, Arkansas on April 23,1994, he headed home to Newtown, CT and continued to fish the Connecticut Federation tournaments. On May 21st, Roy Rickis of Windsor, CT was paired with Bryan for a tournament on the Connecticut River. Roy had carried a 4-½ inch whistle, shaped like a fish, for several years as a good luck piece. When Bryan started pulling in big keeper fish, Roy started blowing the whistle. Bryan laughed when he saw what Roy was doing. He really got a big kick out of it. Roy ended up blowing the whistle all day. Bryan won the tournament and Roy suggested that Bryan carry the fish whistle to the Bass Masters Classic, which was to take place in Greensboro, NC, July 28th-30th. At the Classic, Bryan tooted the whistle twice every time he landed a bass. His observers appeared to have enjoyed the whistle as much as Bryan had. At one point after catching a fish, Bryan said "This one's for you Roy". 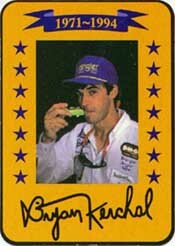 The little fish whistle became his trademark during his inspirational victory at the 1994 BassMasters Classic. Almost two weeks later, Bryan sat down and autographed the whistle to give back to Roy. Roy suggested that Bryan keep it until after he defended his title. Less than five months later, on December 13, 1994, Bryan died in the crash of American Eagle Flight 3379 in Morrisville, NC. In March of 1995, the airline returned his personal possessions in an airline bag. It was difficult to go through the items, which included a telephone book, clothes, a camera and packages of fishing lures. The whistle was not found. Later I tried to locate the whistle. First, I searched through Bryan's room and throughout the house in places where I thought he might have left it. Then I began talking to those individuals who were with him during his last month. Finally, Dave Richey, editor of Fishing World, told me that when he interviewed Bryan during the weekend of December 11th (on a fishing trip at Lake Bacarac in Mexico), he had not seen the whistle. However, Bryan had told him that if he caught a ten pound bass there, everyone on the lake would hear the whistle. Therefore, Bryan had the whistle with him as he began his trip home. My only conclusion was that it had been lost in the crash. In June of 1995, my wife, Ronnie, was going to Florida to visit her mother and decided to use the airline bag, which still had Bryan's personal effects in it. When she emptied the bag, a clear plastic bag full of fishing lures fell on the bed at just the right angle to expose the whistle poking through the lures. Since then, the original whistle has been used as a model to produce a similar fish whistle for sale to collectors, fishing enthusiasts and those who were inspired by Bryan. The first 100 whistles produced were gold plated, numbered and distributed to family, friends and individuals who were a major part of Bryan's fishing experience. The number one whistle, along with the original, went to Roy Rickis who has, in turn, lent them to us to display in our Memorial booth at shows. The Bryan Kerchal Memorial Fish Whistle includes an exact copy of everything written by Bryan on the original whistle. Proceeds from the whistle will benefit The Bryan V. Kerchal Memorial Fund, Inc., which is dedicated to assisting youth oriented fishing programs.